The owner had home visits from three different solar panel firms but had already done a few hours research prior to them visiting. Therefore they had an idea about what they wanted from the panels and roughly what price they would pay for them. The decision was still not taken lightly and the owner took a number of months to come to the final decision. Installation could have been done in around 4/5 hours but unfortunately the router system for the microinverters was faulty. This meant that a lot of time was wasted trying to figure out what the issue was. Eventually the problem was located and a new router ordered. This was then installed around 10 days later. The owner will need to send generation amounts to the utility company to receive the Feed in tariffs. The owner decided to go with microinverters instead of the more traditional single inverter as he felt that the system offered better control levels. The individual inverters for each panel allow Enphase to monitor the panels to see that they are all working correctly and the system can choose to eliminate a panel, rather than lose power, should it not be performing sufficiently. Additionally the associated programme allow the owner to see what his panels are generating, when they are generating and which panels are performing best. Over a period of 20 years the owner felt that these difference would more than cover the extra costs (the owner was offered a system with one inverter for £1,100 less). They do suggest though that the buyer check what levels of experience the installer has with microinverters as issues were created through the chosen installers lack of knowledge. For example it wasn’t explained that additional electrical sockets would be needed for the router system associated to the invertors or that extra Ethernet sockets would be required. During the planning stage some companies suggested that if the internet connection went down then the panels would not generate electricity, however the owner is pleased to say that this is not the case it is simply that you lose the live and recorded connection via the software. The PVs have generated 1726kWh in the first 4 months since installation and are expected to generate 3252kWh annually. 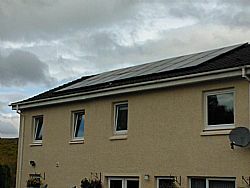 Microinverters are claimed to generate 5-16% more electricity than one central inverter, from records collected in Lochaber by LEG it would appear that this systems initial generation levels are slightly above average. If expected generation levels are achieved then the panels should take 13.75 years to pay for themselves using Feed in Tariffs alone. This period will be reduced further by the savings to the electricity bill, if they were to use 50% of the electricity generated the payback period would be 9.75 years. As feed in tariffs last for 20 years this could leave them up to £6,000 in profit.